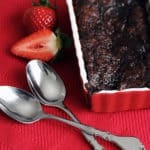 This easy raspberry chocolate pudding cake is half cake, half pudding, and all chocolatey deliciousness. Preheat oven to 350F. Grease an 8×8-inch baking dish. In a small saucepan set over medium-high heat, bring the raspberries, sugar and lemon juice to a boil. Cook for 2 minutes, breaking up the berries with a wooden spoon as they cook. Pass the cooked berries through a fine-mesh strainer to remove pulp and seeds, pressing to extract as much puree as possible. Set aside to cool completely. Scrape the batter into prepared baking dish, and spread it out into a more or less even layer. Spoon the raspberry puree onto the batter in large dollops. Bake in preheated oven for 40 minutes, or until the mixture has separated into a dry cake-like layer on top and a soft pudding-like layer on the bottom. Let stand for about 15 minutes before spooning out into individual serving dishes, topping each with a dollop of whipped cream and fresh berries if so desired. You can make this into individually-sized desserts by using four shallow gratin dishes or ramekins instead. Simply prepare as directed, dividing each of the layers evenly between the gratin dishes, and bake for about 30-35 minutes.